In short, the "administrative monopoly" is a kind of monopolies established by the administrative departments. The definition of Administrative monopoly is that an administrative department, through issuing administrative documents (such as regulations, statutes or suggestions), grants the monopolistic power(s) to business agents--enterprises or profit-making administrative bodies, which are realized as accessing to exceptional facilities and advantages, forming different degrees of monopolistic forces and the status of the situation by setting of barriers to entry and regulating prices. Granting the monopolistic powers to enterprises is important economic decisions and a change of basic economic institutions (the "socialist market economy"). Under the Law of Legislation, monopolies shall be established by the legislature. According to the principle of law reservation, monopolies, without establishments of legislature, are the damages to economic freedoms of potential competitors and choosing rights of consumers. In practice in China, most of administrative monopolies are established by formal files of administrations. This situation is a kind of self-granted. The monopolistic powers established by the administrative public powers are unconstitutional and illegal at some level. Broadly, the Administrative departments use their superiority over drafting legislative acts to establish monopolistic powers in favor of some enterprises through a weak legislature, also regarded as administrative monopoly. Since reform and openness, China’s constitution has been amending several times. There are great changes in its fundamental principles, such as adding principle of “socialist market economy”, and that of “that the state encourages, supports and conducts non-public economy”. The laws including content of administrative monopolies are violated from the principles of constitutions. Almost all of the main administrative monopoly industries discussed in this study is evolved from the complete planned economy. After years of fiscal system reform, the Central Government's main sources of revenue have become taxable income. Central Government has incentive to reform state-owned enterprises but no incentive to abolish the monopolistic powers. Instead, granting administrative monopolies as preferential policies to State-owned enterprises could be a way to reduce the fiscal burden from State-owned enterprises. With the success of China's economic reform, huge domestic markets came to the fore, which in turn highlighted the value of monopolies on these markets. Because the enterprises with monopolistic powers do not need to hand in profits, and have no ceilings on the level of wages and bonuses, they keep all the profit due to administrative monopolies. As interest groups, they have sufficient motivation to strive for greater administrative monopolies. "In-house Lobbying" refers to the behavior that top managements of State-owned enterprises get administrative monopolies through lobbying administration officials. One of the factors is that industry officials and executives in firms can transform identities; mutual access to each other's serving area. This is an important indicator of the administrative monopolies of industries. It appears in several industries in our research. The above “In-house Lobbying” successes because of the existence of “departmental legislation.” The existence of “departmental legislation" is because under the political structure of China, the lacking of practical constraints for administrations leads to the administrative departments, beyond their authorities, influence legislation both directly and indirectly. The so-called "departmental legislation" is administrative-led or even manipulated legislation. Broadly, "departmental legislation" also means that the administrative departments practically make or amend the laws. The administrative monopolies perform as setting barriers to entry and regulating prices, while the latter can be divided into two categories. One is sellers’ price- regulating; the other one is buyers’ price-regulating, leading to the owners of administrative monopolies may obtain resources and other inputs at discounted even zero prices. As long as the institutional barriers to entry exist, even if the other conditions are the same as perfect competition, under some level of demand, administrative monopolies may lead to high prices, low production and welfare losses. Monopolistic, high prices caused by administration’s setting barriers to entry redistribute the original consumer surplus to corporate profits. It is an unfair distribution of income distortions. If using the monopolistic profits as the way which market decided, they can produce a certain number of products. The value of these products (in broad terms, can also be combined with consumer surplus) is the opportunity loss caused by administrative monopolistic (distribution of distorted part), known as social welfare losses. Buyer's price regulating (low or zero factor prices) is a serious distortion of income distribution. It transfers huge wealth which originally belonged to the State or other economic agents to the State-owned enterprises. It is clearly unfair. We assume administrative monopolies use the rents that they miss to pay to occupy more factors of production such as labor, land and capital. If these rents were used in other ways that determined by the market, they can produce more products. The value of these products (can also be combined with consumer surplus) is opportunity losses caused by distortions, also known as social welfare losses. Administrative monopolies transfer wealth in the form of currency from consumers to the monopolistic companies (including their management and staff), which did not use these monetary resources to produce a quantity of products they should do. Take the perspective of society, a large sum of money does not have corresponding product, which will inevitably promote inflation. In recent years, adjusting the deposit reserve ratio, rather than adjusting interest rates, increasingly becomes the primary means of implementing monetary policy. Frequency of adjusting is very high. It is up to 10 times a year (in 2007). Adjustment range is up to 14%, so that the highest rate is 21.5%. This is "unusual". From the point of view of bank, adjusting the reserve requirement ratio and interest rates has a noticeable difference. In particular when implementing tightening policies, increasing reserve ratios will enable banks to avoid the huge costs of raising interest rates. Because public powers are integral factor of administrative monopolies, and impetus of governmental departments in the formation, maintenance and strengthening of administrative monopolies, credibility and authority of the relevant administrative departments were considerably weaken and undermined, while administrative monopolies damage economic efficiency and social justice. Therefore, state-owned enterprises and their control over the national economy (in fact, is the administrative monopolies) is the real "threat to ruling" rather than "ruling basis". 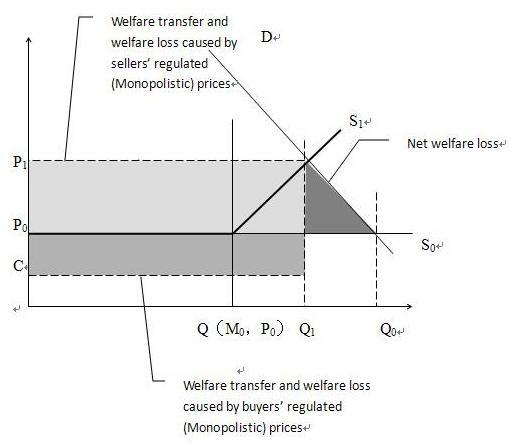 The deep grey part in the figure is the net loss of social welfare caused by administrative monopolies, we called it "social welfare loss I"; The light grey part in the figure is distribution distortion cause by sellers’ monopolistic (regulating) prices, we called it "social welfare loss II"; the grey part in the figure is distribution distortion caused by buyers’ monopolistic (regulating) prices (lower or zero resources prices), we called it "social welfare loss Ⅲ". Estimation of Social welfare loss I: the net social welfare losses of China Telecom, China Mobile and China Unicom from 2003-2010 is about 84.6 billion RMB. From 2003 to 2010, the cap of net welfare loss of telecom industry is about 441.7 billion RMB, and the net social welfare losses of oil industry is about 1309.1 billion RMB. Estimation of Social welfare loss Ⅱ: The annual administrative monopoly rent of telecommunication industry is about RMB 31.3 billion on average. It is also the amount of transferred consumer surplus. Oil industy of monopolistic profit brought about by high monopolistic prices is about 437.8 billion RMB. Salt industry monopolistic profit is as high as RMB 17.7 billion per year. This also is the loss of consumers each year. These numbers are the amount of social welfare losses. Estimation of Social welfare loss Ⅲ: From 2001 to 2010, the amount of land (for industrial use) rent which CNPC miss to pay is about RMB 166.8 billion; the amount of land (for gas station use) rent which CNPC and Sinopec miss to pay is about RMB 176.5 billion; the oil royalty they miss to pay is about 289.8 billion RMB; the financing costs which the big three in oil industry together miss to pay is about 224.5 billion RMB. These numbers are also the amount of social welfare losses. The mean of difference between deposit interest rate and loan interest rate in most market economy countries is in 1%~2%, but the difference between one-year loan and deposit rates is 3.06% over several years in China. This is achieved by lowering 1.5% to the deposit rate. According to average balance of the 2011 national deposit which is about RMB 77.156 trillion, the estimation of the individuals and institutions nationwide interest loss is as high as RMB 1.1573 trillion. It is equal to 2.6% of GDP that year. Generally, it is still very difficult to purchase train tickets. It implicates there is a general supply shortage on ordinary train. From Beijing-Tibet Expressway and Qingdao-Yinchuan Expressway, we can tell the supply shortage of general railway freight. Especially since 2010, there are frequent traffic jams in Beijing-Tibet Expressway which are over 100 km and up to 10 days. Number of trains on the high-speed railway is lower than designed normal levels, which means the high-speed railway resources cannot be fully utilized. This suggests that on the ratio of investment in high-speed railway to ordinary railway is severely misallocated. Report estimates that when the number of the high-speed railway trains departed is up to 129 pairs daily, the utility created by unit cost of high-speed railway is equal to ordinary railway. As we know, the most busy Beijing-Shanghai high-speed railway depart only 50~90 pairs of train daily. This means that the decrease in the construction of normal railways, caused by every kilometer high-speed railway constructed, will lead to a net social loss. In accordance with the relevant data, the amount of welfare losses caused by the misallocated resources between high-speed and conventional railway is about RMB 53.3 billion per year. 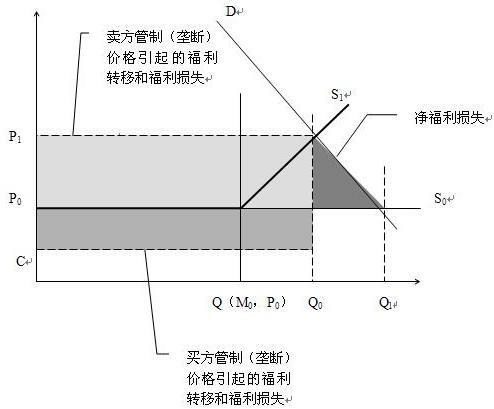 The total amount of social welfare loss I（including the loss caused by resources misallocation in railway）, social welfare loss Ⅱ and social welfare loss Ⅲ caused by administrative monopolies is RMB1. 9104 trillion in 2010, while the amount of latter two is RMB 1. 6169 trillion, which is such a quantity of money without corresponding products and services, and inevitably brings about inflation pressure. Specifically, it will cause inflation by 2.4%, equivalent to 78.7% of commodity-retail-prices-index inflation that year. Taking adjustment of reserve requirement ratio as an alternative means of adjustment of interest rates, the Central Bank raised deposit reserve ratios by 0.5% (as of June 20, 2011). The equivalent interest rate change is 0.375%. It can save the banks from paying interest on deposits of RMB 321.7 billion. Taking adjustment of reserve requirement ratio as an alternative means of adjustment of interest rates, the Central Bank raised reserve ratios six times in 2011, each time by 0.5%. It is equivalent to reduce the interest expense by RMB 1.5623 trillion for banks or their main borrowers. It should establish "legislation evaded rule" for drafts of making or amending laws to establish specific monopolies. In other words, the administrative departments that related to specific monopolies should not draft Bills. At least it should be drafted by a neutral agent(s) that authorized by legislature. Moreover, the legislature should organize the Committee of experts to consult about the drafts establishing of monopolies for specific industries. Furthermore, the establishing of a specific monopoly should be treated as a single monopoly, that is, we cannot use "category" as the unit to create a monopoly. For instance, it cannot set "national economy related" as a category. Administrative departments do not have the power to establish specific monopolies. Any administrative department establishes monopoly through regulations or statutes is illegal. Setting up the rules that related administrative departments should evade the drafting of related "implementation details" or "regulations"; or strengthen the reviewing on drafting of "implementation rules" of specific laws to prevent adding the articles related to establishing or expanding of specific monopolies. The power that administrative departments can regulate the market price should be empowered by the legislature. When an administrative department using its price regulating power, it should be bound by the Price Law, going through fair hearings. In particular, it should differentiate between adjustments of interest rate to implement monetary policy by the central bank and the interest rates of commercial banks, for avoiding regulation of commercial bank interest rates in the name of implementation of monetary policy. The Constitutional resource of public-owned economy and state-owned sector could be used to monitor and constraint the managements of state-owned companies more effectively. Because public resources and assets should be owned by all people, the supervision of these resources and assets should be strengthened. It must be assured that these assets should not be controlled by managements of state-owned companies. Because it is difficult to monitor public resources and assets on institutional and technological term, it should be emphasized in Constitution, and establish corresponding institutions and rules in laws. Standing Committee of the National People's Congress, as a specialized constitutional supervisory authority, can and should review and terminate suspected unconstitutional establishment of administrative monopolies. It should declare unconstitutional and terminate unconstitutional ones in accordance with the current Constitution. At the same time, based on the provisions of existing constitutional law, the Law of Legislation, empowered authorities (mainly as Standing Committee of the National People's Congress or the State Council) terminate, revoke the existing, various administrative files for establishment of administrative monopolies respectively. The judicial reform proposals of breaking administrative monopolies including: first of all, allow clients (but is not limited to enterprises) directly sue the enterprises suspected of administrative monopoly; at the same time, prosecution is not limited to request monopolistic enterprises to bear civil liability, but also have the right to request the Court to review the legality of monopoly. Secondly, emend the relevant legislation, so that courts could have the substantive power to review the cases of administrative monopoly and to dispose monopolistic status. Thirdly, renovate existing antitrust administrative enforcement mechanisms. The keys are to consolidate on institutions and functions, improve authority (for example, it cannot rely on "recommendations to the superior authority"), and legitimate the process (the core is to ensure a fair, transparent and participatory, not internal operations). Fourthly, it should establish the public prosecution system to administrative monopolies. Firstly, directly encourage enterprises, including private enterprises and state-owned enterprises, enter to the areas which absence of legal provisions of monopolies. For instance, in the petroleum industry, there are only the administrative files, but no legal restrictions to enter. The administrative departments that impede enterprises to entry the industries mentioned above should be imposed administrative penalties. Secondly, abolition and prohibit self-granted monopolies of administrative departments (or industrial associations controlled by them) by executive orders. Thirdly, require the Ministry of Finance, the Ministry of Land Resource and other related departments to set up specialized agencies to verify the number of public natural resources (including land, licenses of mining, etc) occupied by enterprises, and charge rents from resources holders at market prices. Fourthly, require State-owned Assets Supervision and Administration Commission of the State Council to set a reasonable state-owned enterprises ' wage ceiling according to the levels of average wage in society, and punish the people who get wage above the bound. Fifthly, request the Ministry of Finance to establish specialized agencies to monitor state-owned enterprises, particularly central state-owned enterprises, to give recommendations on the distribution of profit to the State Council, to strict implement the profits surrender, and to supervise reinvested part of profit. Lastly, promote the state-owned enterprise to withdraw from the profit-making area in the long run.